In 1908, as a result of the fires that spread through the area in previous years, the representatives of Whitman County determined that fire services needed to be organized in order to prevent such an occurance from happening again. A board of commisioners was established, along with the division of Whitman County into 17 different districts - each with their own elected board of commisioners and fire prevention services. As part of those 17 districts, Whitman County Fire District #12 was designated an area centered around the town known as Three Forks (which later was renamed to Pullman). By 1910, Whitman County Fire District #12 was the home of two stations, four trucks, and seventeen brave volunteers. The present day Whitman County District #12 has grown since its early inception in 1910. 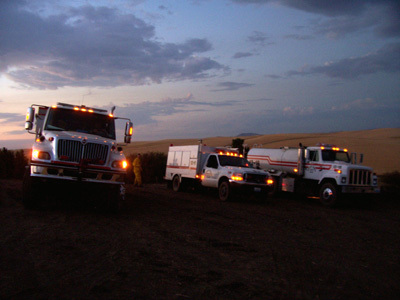 It now is home to three stations, eight trucks, and thirty-five volunteers. Although the size of the district has not increased since its establishment, the number of residents within the county has grown from 410 people to 1700 people. Whitman County Fire District #12 also now provides HAZMAT and EMS services, in addition to wildland and structural fire protection services.